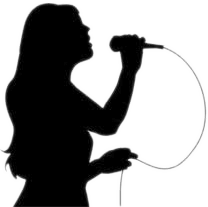 Vocal music is a type of music performed by one or more singers, with or without instrumental accompaniment (a cappella), in which singing provides the main focus of the piece. Music which employs singing but does not feature it prominently is generally considered instrumental music (e.g. the wordless women's choir in the final movement of Holst's The Planets) as is music without singing. Music without any non-vocal instrumental accompaniment is referred to as a cappella. Vocal music typically features sung words called lyrics, although there are notable examples of vocal music that are performed using non-linguistic syllables, sounds, or noises, sometimes as musical onomatopoeia. A short piece of vocal music with lyrics is broadly termed a song. Vocal music is probably the oldest form of music, since it does not require any instrument besides the human voice. All musical cultures have some form of vocal music.